Matthew chapter 26 and Matthew 27:1-5. Judas was one of the original 12 disciples. He is called Judas son of Simon and Judas Iscariot. Iscariot means “man from Kerioth.” Kerioth, known both as Kerioth Hezron and Hazor, was a town located in the northern Negev that belonged Judah (Joshua 15:25). Probably, Judas Iscariot was the only non-Galilean apostle. He kept the community money bag for Jesus and his followers. According to John’s gospel, Judas wasn’t concerned about the poor; rather, Judas was a thief and wanted access to this large sum of money. Judas objected to Mary anointing Jesus’ feet with nard. His objection was that the costly perfume was worth a year’s wages. The nard could have been sold and the money given to the poor. After Mary anointed Christ, Judas went to the chief priests to negotiate money to betray Jesus. The chief priests were delighted with this turn of events and offered Judas 30 silver coins, the equivalent to about 4 month’s salary for a Jewish laborer. Judas agreed on the amount and the chief priests gave the money to Judas immediately. From that time onward, Judas looked for an opportunity to betray Christ that would not cause a riot among the Jews who believed in him. After supper, Jesus went to the garden of Gethsemane to pray. Knowing Jesus spent his nights in Gethsemane, Judas guided an attachment of soldiers, officials, and Pharisees to Jesus. 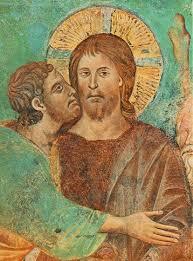 Judas told them that the man he kissed would be Jesus. Walking up to Jesus, Judas said, “Greetings, Rabbi” and kissed him. Immediately, Christ was arrested and taken to the chief priest Caiaphas. By early morning (Friday morning), the Jewish hierarchy determined to put Jesus to death. They bound Jesus and handed him over to Pilate, the governor. When Judas saw that Jesus was condemned, he was filled with remorse. He tried to return the 30 silver coins to the chief priests and elders saying, “I have sinned, for I have betrayed innocent blood” (Matthew 27:4.). Callously, they responded, “What is that to us? That’s your responsibility.” Judas threw the money into the temple and went out and hung himself. Reflection: Do you think that Judas repented his betrayal of Jesus? This entry was posted in Apostle and tagged Betrayer, Jesus, Judas Iscariot, Obscure Bible Characters, Repentance. Bookmark the permalink. ← Thaddeus, Was he for real?